One of the magics of Bali is the extraordinary variety of its fruits and vegetables. On the fertil slopes of the volcanoes, can grow almost any kind of fruit trees and vegetables. The coconut is particularly appreciated because of the recognized vertues of its juice for health. But not only. At Dajuma our guests can also enjoy other healthy drinks (we call them “healthy coolers”) made from carrot, orange, ginger, broccoli, avocado, mint, turmeric and tamarin that you can drink as much as you like. 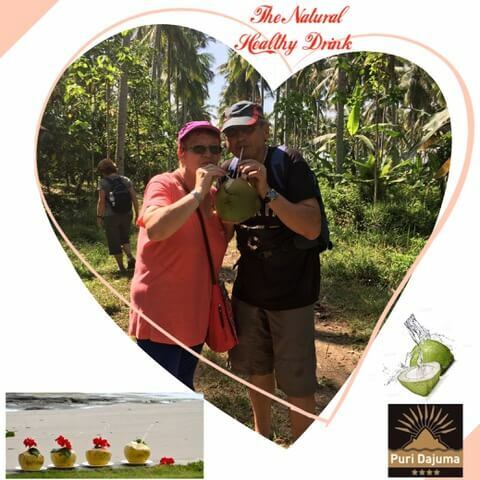 On the picture: Josiane and Alain FRANCOIS savoring a coconut offered by our guide during their ecotourism trek in the nearby Pulukan State Plantation.